New ultrasonic generator technology for 3D uniformly distributed, ultrasonically assisted metal casting, mixing, forming and ultrasonic degassing of molten aluminum- and other non-ferrous melts. New PDF: Various methods for introducing sonication in liquid aluminum and magnesium alloys (PDF, 873kB). New Article: MMM Ultrasonic Metallurgy (150KB pdf) from Aluminium International Today, the journal of aluminium production and processing – September/October 2014. www.aluminiumtoday.com. 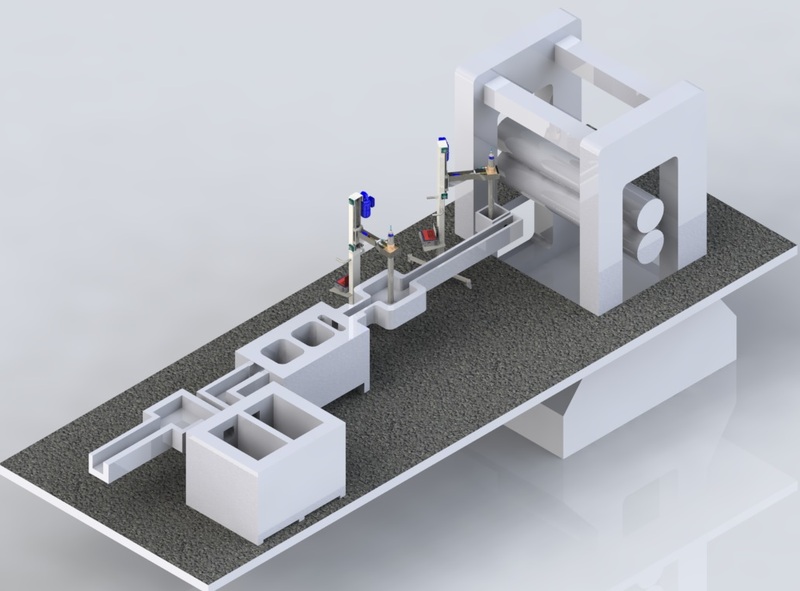 Ultrasonic continuous casting without centreline segregation, conventional degassing and grain refiners. New Article: MMM Ultrasonic Metallurgy (4MB pdf) from Aluminium International Today, the journal of aluminium production and processing – May/June 2014. www.aluminiumtoday.com. The quality and competitiveness of casting strongly depends on the quality of molten alloy and the technology used to produce it. With regards to quality, the casting of aluminium alloys is not easy, since alloys are prone to dendritic and heterogeneous structures, as well as the absorbtion of hydrogen during melting, which requires a specific melt processing operation in order to reduce and control the level of porosity in a microstructure after solidification. By H. Puga, M. Prokic, N. van Dongen. MMM ultrasonic driving creates uniform and homogenous distribution of acoustical activity on the surface and inside of the vibrating system, while avoiding the creation of stationary and standing waves, so that the whole vibrating system is fully agitated. Click on the image to download as pdf. Development of a new ultrasonic electronics and a system feedback concept that allows real-time adaptation to continuously evolving acoustic conditions. Capability to ultrasonically drive any arbitrary shape or large mechanical system at high energy if needed- Ultrasonic driving of system harmonics and subharmonics gives a wideband multi-frequency effects that improves stimulation of the system. – Elimination of ultrasonic standing waves gives uniform treatment of material. Improved metal homogenization and mixing of new alloys.- Improved crystallization and alloy characteristics in casting.- Friction reduction between a tool (e.g. casting, drawing, extruding, molding) and the material being worked improves the material flow.- Improved Surface finish on extruded or drawn materials.- Reduce or eliminate material voids or cavities in casting or molding applications. -Alloys’ density increase until theoretical limits. – Power Supply Generators are available in a standard range of 300 watts to 2,000 watts. Custom systems available to 120,000 watts. Grain refinement, with significantly improved and 3D uniformly distributed micro-crystallization. Disintegration, elimination, wetting and dissolving of non-metallic and metallic inclusions, making smooth intermetallic transitional area. Alloys mixing with nano-particles, increasing density of the alloys, varying percentages of alloys ingredients. Improving chemical, mechanical and physical properties and corrosion resistance e.g. in Al-Li alloys and other aerospace alloys. Ultrasonic World (www.UltrasonicsWorldGroup.com) has developed a new technology that applies high power ultrasonic energy to large, heavy irregular mass or un-tuned mechanical systems such as extruder, drawing die, mold tools, metal melt mixer, continuous casting, homogenizing, degassing, alloying, very fine and homogenous micro-crystallization, sintering, etc. A new AMMM ultrasonic generator technology has been developed to allow the use of conventional high amplitude transducers to drive large irregular shapes and un-tuned mechanical systems such as extruder heads, drawing die, injection mold tools, or a metal melt mixer. This new technology has the unique capability to stimulate wide-band sonic and ultrasonic energy (ranging from infrasonic up to the MHz domain). The key to the technology is its use of a proprietary technique to analyze feedback signals and create custom driving wave forms to initiate and control ringing and relaxing, modulated, multimode mechanical oscillations in the harmonics and sub-harmonics of the attached mechanical system. We are able “to see”, measure and control the cavitation in real time (without submersing sensors for cavitation in a liquid metal). We know what the essential parameters of ultrasonic waves are in order to create cavitation. We know what to change, or implement during ultrasonic agitation for producing and controlling certain level of cavitation in liquids. Our expertise in “self-sensing techniques” developed from other ultrasonic related applications [1, 2] has opened new ways to address the cavitation measurement challenge. Thus, we are now able “to see”, measure and control the cavitation in real time (without submersing sensors for cavitation in a liquid metal). We know what the essential parameters of ultrasonic waves are in order to create cavitation. We know what to change, or implement during ultrasonic agitation for producing and controlling certain level of cavitation in liquids. Moreover, the dynamic of the ultrasonic transducers active power is continuously monitored with modern signal processing techniques [3, 4, 5]; this involves a novel approach which is very rarely available in standard monitoring systems. It is worth mentioning that the instantaneous parameters of the active power turn out to be closely linked to the most commonly desired structural characteristics of aluminum as well as to the total power consumption of the metallurgical process. H. Puga, J. Barbosa, E. Seabra, S. Ribeiro, M. Prokic – The influence of processing parameters on the ultrasonic degassing of molten AlSi9Cu3 aluminium alloy. Materials Letters, Vol. 63, pp. 806-808, 2009. H. Puga, J. C. Teixeira, J. Barbosa, E. Seabra, S. Ribeiro, M. Prokic – The combined effect of melt stirring and ultrasonic agitation on the degassing efficiency of AlSi9Cu3 alloy. Materials Letters, Vol. 63, pp. 2089-2092, 2009. H. Puga, S. Costa, J. Barbosa, S. Ribeiro, M. Prokic – Influence of ultrasonic melt treatment on microstructure and properties of AlSi9Cu3 alloy. Journal of Materials Processing Technology, Vol. 211, pp. 1729-1735, 2011. H. Puga, J. Barbosa, S. Costa, S. Ribeiro, A.M.P.Pinto, M. Prokic – Influence of indirect ultrasonic vibration on the microstructure and mechanical behavior of Al-Si-Cu alloy. Materials Science and Engineering A, Vol. 560, pp. 589-595, 2013. M. Prokic, M. Radmanovic, K. Hedrih – The change of Electrical and Mechanical resonant Characteristics under Conditions of Various Trans. Loads, GAMM, Dubrovnik, pp.1-24, 1985. M. Prokic – Multifrequency Ultrasonic Actuators with Special Application to Ultrasonic Cleaning in Liquid and Supercritical CO2. UIA Conference, Atlanta, 10-12 October 2001. 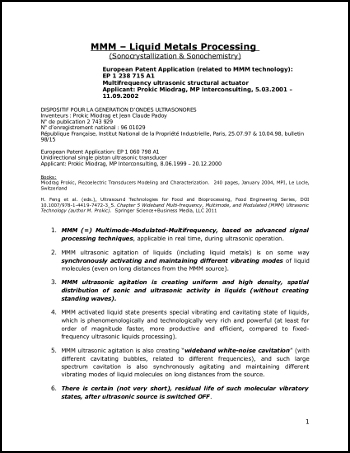 M. Prokic, J. P. Sandoz – Innovative MMM Technology for Implementing Power Ultrasonic Technique in Food-Processing Industry. IFT Institute of Food Technologists) symposium 2005 – Advances in Power Ultrasound Research and Technology: Food and Bio-product Applications. New Orleans, USA, July 2005. Miodrag Prokic – Piezoelectric Transducers Modeling and Characterization. 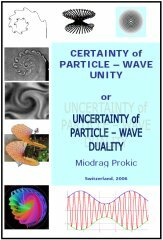 Miodrag Prokic – Chapter 5: Wideband Multi-frequency, Multimode, and Modulated (MMM) Ultrasonic Technology. Ultrasound Technologies for Food and Bioprocessing. Food Engineering Series, pp 125-140, 2011.